~ Being an entrepreneur is hard. Much harder than than it initially appears to the first-timer, and widely misunderstood by those who have never tried it. It's hard because it requires both you be quite good at many very different things, have broad skills, and also that you recognize what you're not good at it, and get help, or coaching, or an able co-founder to complement your strengths. But all that is doable by those with commitment. What's not so easy is to find a way to the pay the bills until your venture starts paying for itself. 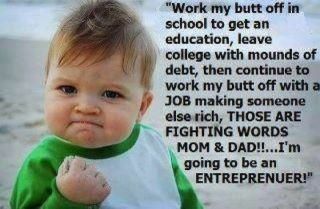 Those of you who fantasize about being an entrepreneur: look at it really closely before you jump in. It’s not easy. To pervert a phrase, it’s feast or ramen. Before you hit it big, if you hit it big, you go through a lot of lean years. I don’t think it’s any accident that some of the most successful entrepreneurs are people who, by dint of their birth, or who they knew, and occasionally by their sheer brilliance and perseverance had some early financing to get going. They had a previous success, perhaps. That had some way they could feed themselves, they could look after their families, while they built the business. Now, if you’re doing a software thing you don’t need a really long runway potentially until you get to revenue. If you’re building a life sciences company, a manufacturing company, you might need a couple of years. So, if you haven’t already had that big payoff and you don’t have parents you can borrow 10,000 bucks from or what-have-you… what are you going to do? So the thing that would be really helpful is to find some way to make entrepreneurship perhaps not lucrative, but at least a sustaining career for people… You’ve all seen the funnels of the universe of people who have an idea, and of those how many get a plan written, how many pitch to an angel group, how many get to present to an angel group and how many get funding from an angel group, and how many actually have a pay-off. It’s a real wide funnel at one end and a really narrow one at the other. I suspect that there are a lot more people who fall by the wayside with commercializable, valuable intellectual property that could be a good company. Maybe not an investable company; maybe it’s more of a lifestyle company, but it’s a company that could make money, make revenue for the state, make money for the people who do it, maybe do good for society. But a lot of those companies can’t make it. Is there a way to change that? I’ve got several ideas. The chance to share some of those ideas never arose, so one thought here instead. A straight-forward and practical tack would be to expand the qualifications for those collecting unemployment insurance. Currently, if you are unemployed you can collect state insurance payments provided you can demonstrate you are seeking work. The bar here in Washington is really rather low—just three job-related contacts per week. Such contacts include submitting a resume, making an application for a position, or having an interview. What if working to build a startup business also qualified for unemployment benefits? The value to the economy, to state tax revenues, to the founder and later new hires of a new business are both obvious and frequently lionized by political leaders. With the difficulty so many are having in finding a job, there is an increased desire to found a new business instead. The limiting factor for many, however, is that the bills must still be paid until the work (one hopes) pays off in a revenue-producing business that can stand on its own. There are logistical challenges certainly in ascertaining whether someone is really doing the work of building a startup rather than spending days loafing while collecting a check. However, the current system relies heavily on good-faith reporting by the recipient of the (minimal) funds. In my (mercifully limited) experience receiving unemployment, the strictness of the oversight is lax to non-existent. (Note to auditors: I kept all my records to prove I was legit!) So adding entrepreneurship as a qualifying activity doesn't seem much of a stretch. There are ways auditing could be enabled. Being affiliated with one of the growing number of incubators would be both easily verifiable and a way to get a higher success rate. Or working independently with non-profit entities such as SCORE. Or working with a qualified venture consultant; I'm just one of many that helps fledgling entrepreneurs increase their effectiveness and shorten the path to success. The state could even direct some additional funds to those incubators, advisors and consultants specifically to assist the unemployed to create new enterprises? The value and results from those expenditures are certainly worth their looking at. The state already spends money on Entrepreneur-in-Residence (EIR) and Innovation Partnership Zone (IPZ) programs, so why not establish a BEST program to Build Entrepreneurial Startups Today? The future of work has changed. It's time our ecosystem, including government, adapted.